Have you always longed to see Oliver Queen dressed like He-Man? I know I haven’t. And if you have, then I honestly don’t want to know your other hidden desires. Not that I’m judging, mind you. 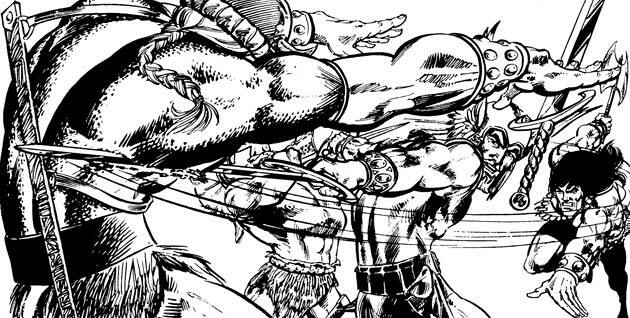 In any case, you could be forgiven in thinking, from first glance, that the main character in Warlord is Green Arrow forced back in time – to the days when sword wielding warriors were the super-heroes. Thankfully, this isn’t the basic plot of Showcase Presents: Warlord at all. In fact, the story is set in near modern times, in an odd little corner of the DCU. We shall take a dizzying journey back to when a dozen eggs were only $0.62, way back to 1969. It is a year that stands out in peoples’ minds for numerous reasons – the most obvious two being the Moon landing and the first ever Woodstock. However, just a month before the landing and 2 months before the festival, on the 16th June, Lt. Colonel Travis Morgan USAF is in the middle of a dangerous flight over the USSR. All is not well. Our latent hero in waiting has been detected by those pesky Ruskies and has Soviet missiles on his tail. Somehow, he manages to come out of it with just a fuel tank malfunction and takes a 2000mph glider over “enemy” territory. Morgan has no choice but to try and make it to an emergency support base in Alaska, via the north pole. Once he spots land he ditches out of the plane and parachutes to the safety of the freezing cold Yukon. Breaking through the mist and the clouds he finds himself instead in a tropical jungle of epic proportions. It’s a safe bet that this isn’t the Yukon he’s landed in. – It was past 6pm, yet the sun is at high noon, in the middle of the sky. – The sun is also somewhat larger than it has ever been before. – The horizon is gone. Instead, the jungle just curves upwards into the distance, until it is out of sight in the mist. “If this is Canada, Joe Namath wears Pantyhose,” our central character remarks. But where exactly is he? After a quick fight with a dinosaur, he meets some locals and the mystery is solved. The answer is quite simple. He is inside the Earth, where a ball of flaming gas acts as a sun that never sets. This land is called Skartaris. A bizarre concept, but one that people have thought to be true in days gone by. It does lead to some quirky plot opportunities to come later in the volume. The most interesting one is the sheer inability to effectively measure time when there is no night. In fact, the concept of time is played with, fast and loose. One example of this coming into play is that Morgan’s “quick nap” is long enough to grow a full length beard, which, along with some new duds, completes his He-Arrow/Green-Man (take your pick) appearance. And those strange events are just the start. In fact, all that happens in the first 15 or so pages! 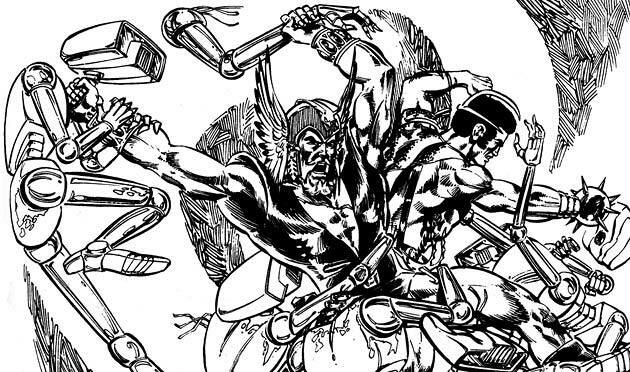 Mike Grell writes and illustrates everything contained in Showcase Presents: Warlord. The book collects the 1st Issue Special and the first 28 issues of the ongoing series (out of over 120 issues). The stories all tend to follow on from each other loosely, with a couple of multi-issue plots rounding out the thick trade. His stories follow Morgan during his initial exposure to this strange new land and through the life he makes there. Grell treats us to some good old fashioned fantasy plots mixed in with more modern influences. Expect fights galore, a whole multitude of strange species, and a diverse group of clans/empires for Morgan to interact with. The quality of the writing is very high and, despite being 40 years old, is still as enjoyable to read as most modern titles. Out of the 20 Showcase Presents volumes I own, this is the only one I was able to read cover to cover in 3 or 4 sittings. Very impressive for 528 pages of Bronze Age comics, which often have more packed into each issue than a four to six issue modern comic. 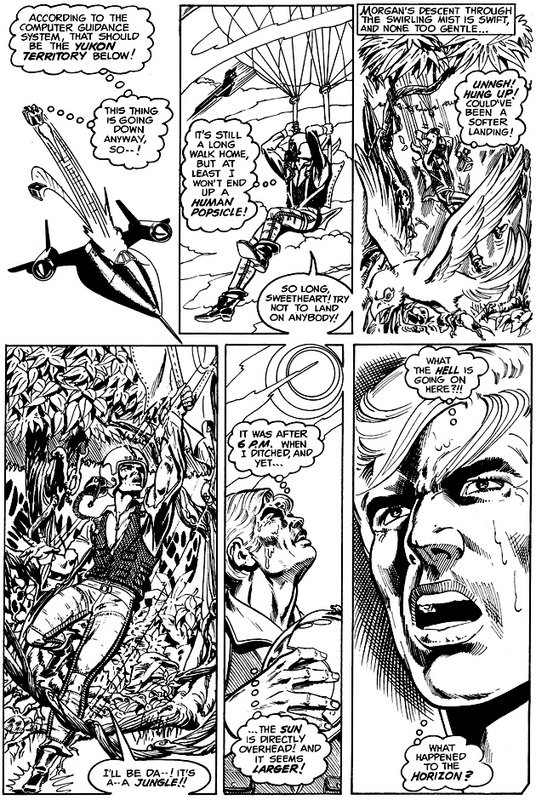 Mike Grell‘s art is reproduced in black and white, as in all Showcases, which suits his pencils very well. His drawing ability, especially evident on the characters, shows real craftsmanship. While they all seem to be in skimpy costumes (both genders), their bodies are perfectly sculpted in almost every panel. The physicist (my day job) inside me makes it hard to swallow certain things in this volume. I had to force myself to ignore the attempts to use physics to explain the strange world of Skartaris, often being completely wrong. Non-physicists and younger readers obviously wouldn’t have this issue. Thankfully it was easy to skim over these parts as they were very brief. My biggest issue is that the plot was sometimes a little shallow or linear. This was common in comics of the period, however it still is in stark contrast to the depth of the plots modern comics can have. 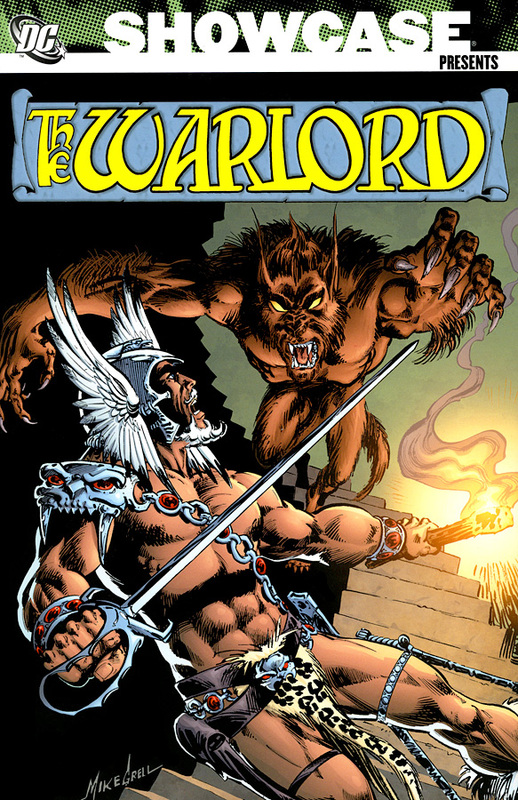 I can’t hold this against Showcase Presents: Warlord – it simply is a comic of its time. A very good one. This is my favourite Showcase that I have gotten my hands on. I can only hope DC Comics decides to release another 3 (or 4) more to collect the remaining issues. Epic is the best word to describe these stories. Truly epic. If you can get past the fact that this was probably the inspiration behind He-Man, you will find yourself with a very enjoyable read. Entirely required if you hope to follow anything featuring Morgan/The Warlord, although he is a character not seen elsewhere very often. His stories are mostly contained within this small corner of the DC Universe. Best to start here. The character didn’t exist before these stories. 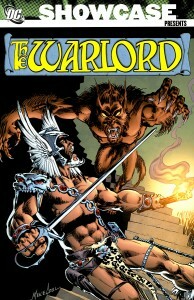 There is also a color reprint, though, of 1st Issue Special 8 and Warlord 1-12 in The Warlord: The Savage Empire. That book is a little harder to find, but if you absolutely must have color, there’s your option. You could give the modern arc a go, starting with Warlord: The Saga or join me in waiting for a second Showcase to be released. The Warlord reading order is sparse, as he makes brief cameos in a few books but not many of his more substantial appearances have been collected. Various DC characters and teams travel to Skartaris, but don’t always bump into Morgan. Alternatively you could try and find yourself some He-Man and the Masters of the Universe comics. some good old fashioned fantasy plots mixed in with more modern influences. Expect fights galore, a whole multitude of strange species, and a diverse group of clans/empires for Morgan to interact with. Thanks for tackling a showcase book, Simon! These ones can take a lot of effort to review, in part just because they’re so packed! Luckily, this wasn’t one with a hundred different authors. Some of them really run the gamut in terms of quality. This one is Bronze Age, actually. The showcase books, as far as I can tell, are all Silver/Bronze Age, except for two Modern Age ones. Maybe just the Booster Gold one. 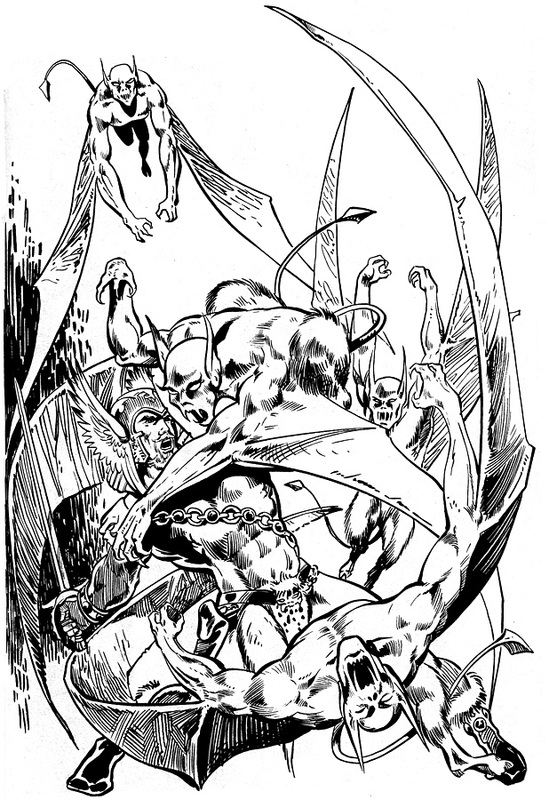 Golden Age art tends to be a lot more basic. When in doubt, check the database entry! Except for a few misses, most should have tags and I think almost everything has dates. Yeah, to me Golden Age is classic “This is what you read in your childhood.” Over the top heroics and some really silly stuff. I’m actually reading a ton of DC trades in order from Identity Crisis up until Return of Bruce Wayne. I just finished Batman and Son and will start Green Arrow: The Road to Jericho soon. I have about 100 trades left until I hit RoBW. 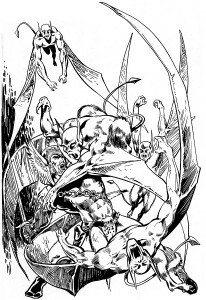 I will then start all over at the beginning with Green Lantern Emerald Dawn and Batman Shaman. I’ll likely pickup some much older collections (showcase) too at that point if I can. It think it will be interesting to see the differences between now and then with an indepth reading. There is that old saying about the golden age of comics being whenever you were ten. Man…years and years ago I stumbled across a First Issue Special #8 in a cheapo box in the backroom of real seedy store in…Vegas, I think. I figured it was destiny and so I tracked down every issue of Warlord. This was back when searching for comics and that thrill meant something instead of going on eBay or just picking up the trade. I still have them all in one of the several dozen longboxes in my garage…and I miss that feeling (the best adventure was completing a ROM collection!) Warlord rocked. None of the reboots or restarts worked, but those early issues were just chock full of in. I have the Showcase here, because I’m a damned idiot completist, but I doubt it’ll ever get cracked open. If I want to read it, I’m going to the source. I’m waiting on a Shazam Monster Society of Evil hardcover that’s almost impossible, for one. When I got a deal on the Deadman Collection, I was similarly excited. Nowadays a lot of my fun comes from finding low prices on these rarities. I have self imposed limits cause of pretty strict budgeting. Warlord was one of those titles that I never heard anything about and from first glance looks bit questionable; I think I saw the Showcase on-line for a couple pounds and thought I may as well get it, one of the best bargins I’ve ever found. Your current post provides established beneficial to me. It’s quite useful and you really are certainly really knowledgeable in this field.